Okay since no one else jumped in to open this one I will - what are we doing this month?? Last edited by growler~GateKeeper; January 3rd, 2009 at 05:18 PM. LOL.....I was just wondering the same thing a little bit earlier but it's getting harder and harder to come up with NEW ideas. Doesn't matter to me .....I'm just drawing blanks right now. 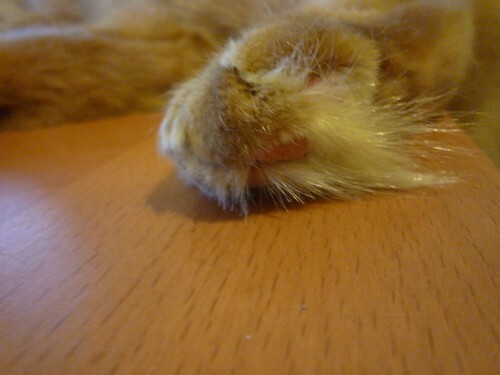 Kitty feet are always cute but doggy feet are all cracked and ugly. LOL.....just like the lines on my face. I don't know, but I think animal paws/feetsies (whatever you want to call them!) is a cute idea I have a couple paw pictures floating around I've never had anywhere to post. "Starting the year off on the right paw " ~ I like it! Last edited by krdahmer; January 2nd, 2009 at 12:27 PM. or what about "new things".... like puppies, kittens, babies, pictures of when your baby was "new" (some "new" things arrive with a few gray hairs ), new houses, new cars, new toys . Maybe a bit to cheesie for the "New Year"?? How about Cerberus checking out Brier's stinky paw? That counts as pets/paws/close ups/imaginary friends....which about sums up hazel's world! Bunduk a la Superkitty pose " I believe I can fly, I believe I can touch the sky"
Here my jagger foot pic. Oooo, Jag has nice, tight, compact paws! Ours have loose hairy ones! Cute feeties Jag can I tickle them? Yes you can if you can reach them . oh and Kr, I love palmoline's paws!!! How adorable is that! So unique too. Not sure if this is common... 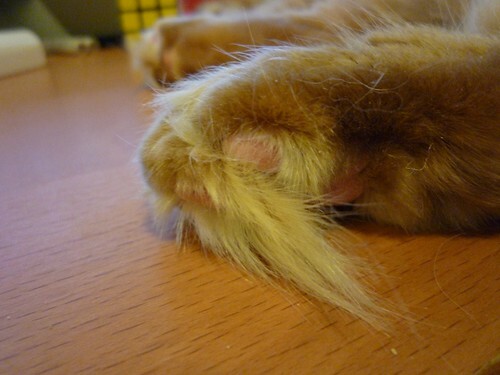 The hair mainly grow between the toes and downward. Sometime it does get messy because kitty litter can stick to it. Yes, I think you should. At least so the litter doesn't stick. That would not be healthy for him to be ingesting all that litter. All the other pics are wonderful!!! I was going to post close ups but it seems like the feel of the thread is more toward the feetsies. I will save the closeups. I was going to post close ups but it seems like the feel of the thread is more toward the feetsies. I will save the closeups. someone mentioned I should post this here .... here Nelly's paws , will try to get better pics later ... and Paddington rendition of "Stop , in the name of love"